A (Load) Balancing Act: The Challenge Of Clean Power As new solar and wind energy projects come online in California, electricity grid operators are struggling to smooth out the irregularities in power that come from renewable sources. They are exploring huge batteries and flywheel technology, but such devices are expensive and have limitations. Solar and wind power are booming in California, but there are times when the sun doesn't shine and the wind doesn't blow. So California utilities are looking to smooth out those bumps by doing something rarely done on the grid today: storing electricity. NPR and member station KQED are exploring California's ambitious plans to generate one-third of its electricity from renewable sources by 2020. Part 4: Full Steam Ahead For California Geothermal Plans? The California Independent System Operator is the traffic cop of the state's electrical grid. Its job is to forecast how much electricity the state needs -- every four seconds -- and to make sure it's supplied. Inside an unmarked building outside of Sacramento, dozens of people are glued to computer screens, and on one wall, there's a display plotting a big red line showing how much electricity California is using right now, in real time. "Our electric grid today, as we've built it and managed it, is a huge 'just in time' delivery system," says Dave Hawkins, an engineer at the California ISO. Hawkins says that in order for the lights to come on when we flip a switch, energy supply and demand have to be in perfect balance. "If we don't get all the numbers correct, then there's some major imbalances and some unpleasantness that happens in the system," he says. Today, most of the state's energy comes from natural gas plants, which produce a steady power supply. But record amounts of wind and solar power are being switched on every year. And because the sun disappears behind clouds and the wind dies down, renewable power is variable. "The curves that are showing up so far are pretty erratic," Hawkins says. "You'll see 40, 50, 60 percent change in the output in a very short amount of time." Better weather forecasting could help the ISO anticipate the fluctuations, but Hawkins says they'll need something else to fill in the gaps. Just outside of Los Angeles in Huntington Beach, Praveen Kathpal of AES Energy Storage shows off one of the biggest batteries in the state. From the outside, it looks like a simple shipping container. "We're looking at what we call Project Sano. 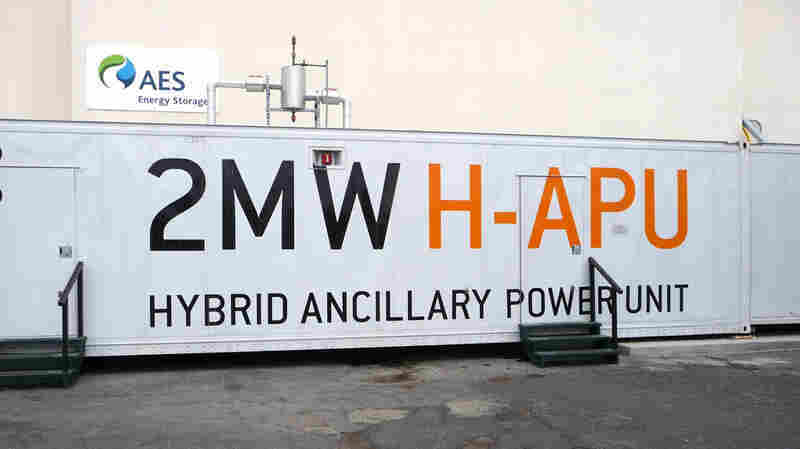 It's a 2-megawatt energy storage unit," Kathpal says. "It's pretty unspectacular to look at, which is good -- we don't like excitement in the power business if we can avoid it." This shipping container turned battery holds enough power for 1,500 homes and is made of 83,000 small lithium-ion battery cells. Electric grid operators can use battery technology like this to help smooth out fluctuations in electricity as a result of the irregularities of using renewable sources like wind and solar power. Inside, the container is packed with 83,000 small lithium-ion battery cells. This test battery holds enough power for 1,500 homes, and Kathpal says grid operators can use the electricity to smooth out the second-to-second fluctuations on the grid. 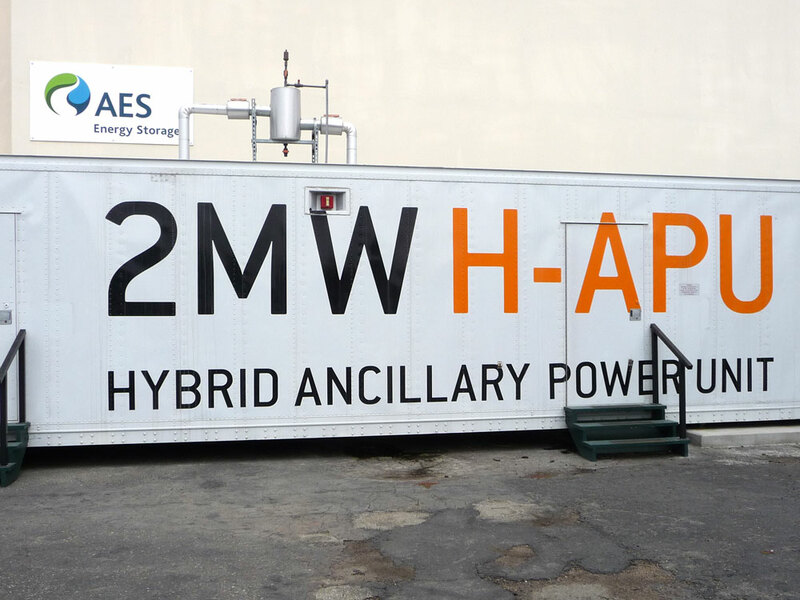 Batteries and other energy storage technologies could also be used for longer term storage, especially for wind power. "Unfortunately, a lot of the wind blows at night, and we don't want to spill wind," says Dan Rastler with the Electric Power Research Institute, a nonprofit research and development group sponsored by the nation's utilities. Rastler says if nighttime wind power could be stored in batteries like the one made by AES for several hours, grid operators could use it during the day when energy demand is highest. Still, there's one big problem: Batteries and other storage technologies are expensive. At its best, battery storage costs twice as much as traditional power sources. That's kept most utilities away. But Rastler says the federal stimulus funding could change the game. "It's been huge -- I believe it's around $250 million of stimulus funding -- [it] really is jump-starting a number of key demonstrations," he says. Several of those demonstrations, or pilot projects, are being led by California's largest utilities. But given the cost, scaling up energy storage could take decades, and California's utilities are on a tight timeline. They're required to get one-third of their electricity from renewable sources by 2020. Bringing renewable energy sources onto the grid also presents challenges. Wind and solar electricity are inconsistent and unpredictable, so technology to rapidly balance demand with supply are needed. Here are a few under development. Batteries Several kinds of batteries can be used for large-scale energy storage, including lithium-ion, sodium-sulfur and lead-acid. Use: Second-to-second balancing of grid fluctuations or energy storage over several hours. $1,200-4,000 per kilowatt Can discharge energy quickly to help balance the grid. Expensive technology. Flywheels This technology uses rotational energy to store power. Flywheels have an internal rotor that uses electricity to spin at high speeds. When energy is needed, the rotor slows down and generates electricity through a motor. Use: Second-to-second balancing of grid fluctuations. $1,800-1,900 per kilowatt Can discharge energy quickly to help balance the grid. Expensive. Useful for only short durations. Compressed Air Air is pumped into large underground caverns using off-peak or excess energy on the grid. When electricity is needed, the air is released and expands to help run natural gas turbines. Use: Stores excess energy from wind power at night for use during the day. $900-1,000 per kilowatt Low cost way to store large amounts of electricity for several hours. Special underground sites are needed to store the compressed air. Turbines or expanders also use natural gas. Pumped Hydro Conventional hydropower uses water and gravity to generate electricity. Storage is added by pumping that water back uphill to an upper reservoir, so it can flow downhill and generate power again. Use: Stores excess energy from hydro power at night for use during the day. $1,500-2,500 per kilowatt depending on site and permitting. Stores large amounts of electricity. Proven technology. Long life. Specialized location and infrastructure needed. Potential environmental impacts.